The Raptors are about ready to start playing Kawhi Leonard in back-to-back games, relays Tim Bontemps of ESPN. Leonard was limited to nine games last season with a quad injury and Toronto hasn’t used him on consecutive nights since acquiring him in an offseason trade. However, coach Nick Nurse told reporters tonight that it will happen soon. Leonard is posting MVP-level numbers in his first season in Toronto, averaging 26.8 points, 8.4 rebounds, 3.1 assists and 1.8 steals per game. He was inactive tonight after scoring 37 points Friday. It’s the ninth game he has missed this season, with five of those being classified as “load management.” The next back-to-back on the Raptors’ schedule will be January 5 and 6 against the Bucks and Pacers. Leonard is still bitter over a comment from Kevin Durant four years ago, which could provide complications for any team hoping to add both star free agents, according to ESPN’s Brian Windhorst. After Leonard was named MVP of the 2014 Finals, Durant seemed to dismiss the accomplishment, saying he was a product of the Spurs’ system. OG Anunoby provided a glimpse of the talent that some people have been raving about in Friday’s win over the Cavaliers, writes Doug Smith of The Toronto Star. Starting for the fourth time this season, Anunoby tied his career highs with 21 points and eight rebounds. “I was planning on his growth being really a big leap forward this year,” Nurse said before the game. “For any number of reasons it hasn’t happened yet, but I still believe in the guy. I still believe we’re going to see that.” Anunoby is a versatile defender in addition to his offensive skills, but Smith notes that it’s hard to carve out minutes for him when the lineup is fully healthy. Norman Powell‘s return from injury could squeeze C.J. Miles out of the rotation, tweets Josh Lewenberg of TSN Sports. 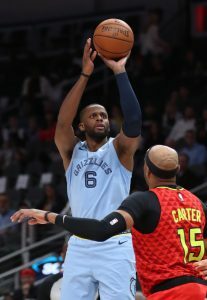 The 31-year-old has seen his production regress in his second season with Toronto, averaging 5.1 PPG in 28 games while shooting .315 from the floor and .286 from 3-point range. He has an $8.73MM player option for next season. Two Raptors sharpshooters in possible contract years are having two very different seasons so far, writes Michael Grange of Sportsnet.ca in a look at Danny Green and C.J. Miles. Green, earning $10MM this season, will be an unrestricted free agent in 2019 and is playing as well as he has in years, averaging 9.6 PPG, shooting a team-best 43.0% from the beyond the arc, and providing strong perimeter defense. He’ll be 32 years old when he hits the open market next July, but he’s positioning himself well for at least one more nice payday. On the other end of the spectrum, Miles has struggled mightily so far in 2018/19 — his 5.5 PPG would be his worst mark since the 2007/08 season, and his .288 3PT% is substantially below his career mark. Miles figures to bounce back at some point, but he looks like a virtual lock to exercise his $8.73MM player option for 2019/20 rather than opting for free agency. Speaking of Leonard, he has a new multiyear endorsement deal in place with New Balance, league sources tell Chris Haynes of Yahoo Sports. The former NBA Finals MVP passed on an extension with Jordan Brand earlier this year. Mavericks star Dirk Nowitzki is targeting next month for his season debut, tweets Tim MacMahon of ESPN. Nowitzki provided an update today on his condition as he continues rehab work after having surgery on his left ankle in April. “Hopefully somewhere in December, I’ll be ready,” he said, although he hasn’t been able to participate in a full practice since the operation. Nowitzki saw some action in a “staff game” today, playing against interns and younger members of the coaching staff. “I wasn’t the best player out there, so I have some work to do,” he said. 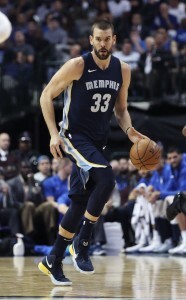 Nowitzki, who turned 40 over the summer, remained effective last season, playing 77 games and averaging 12.0 points and 5.7 rebounds per night. He has indicated that this may be his final NBA season, although he hasn’t made a formal announcement. Bulls forward Lauri Markkanen continues to make progress in his return from a right elbow injury and could start practicing with contact next week, according to the Chicago Sun-Times (Twitter link). Coach Fred Hoiberg said Markkanen has made major improvements with his conditioning. He suffered a high-grade lateral elbow sprain during training camp. Hoiberg added that Kris Dunn is ahead of Bobby Portis in recovering from knee injuries that they suffered within days of each other (Twitter link). The Raptors are moving closer to using Kawhi Leonard in back-to-back games, coach Nick Nurse told Ryan Wolstat of The Toronto Sun (Twitter link). Nurse added that the team’s strategy with Leonard over the first quarter of the season has been successful, and there have been no problems when he has been asked to play a lot of minutes. “He feels good,” Nurse added of Leonard, who was limited to nine games with the Spurs last season because of a quad injury. The Raptors‘ C.J. Miles missed his fifth straight game tonight with a groin strain, but he should be back soon, Wolstat adds (Twitter link). Maurice Harkless is returning to the Trail Blazers‘ lineup tonight after missing 13 games with a sore left knee, tweets Joe Freeman of The Oregonian.